Schnepf Farms in Queen Creek, Arizona is a pretty special place. While Arizona as a whole is well known for growing cotton, Schnepf Farms is the largest grower of peaches in the state. These peaches are known to be some of the tastiest in the country, and the Schnepf’s are not afraid to share their hard work. Every spring the complex is home to the Schnepf Farms Peach Festival, replete with opportunities for peach picking, hay rides, train rides, fresh baked peach goods, and other good stuff too! Schnepf Farms was started by Ray and Thora Schnepf in the 1950s in the rural desert countryside southeast of Phoenix. As encouraged by the sandy desert soil, the Schnepf’s started out growing vegetables, and over the years expanded to growing things like palm and pine trees. The famous peach orchards were planted in the early 1960s. By the 1970s, Ray Schnepf discovered that offering “U-pick” opportunities to passers-by was a simple and low cost way to sell his crops, and his farm started becoming a destination for produce lovers across Arizona. By the 1990s, the town of Queen Creek was growing rapidly, just like the rest of the state. Schnepf Farms was under pressure to sell off their land to developers that would turn the fields into neighborhoods. Bits and pieces of the farm were sold, but the peach orchards still remain, and the Schnepfs have turned much of their farm into a fairground that provides the venue for their springtime Peach Festival, as well as other events like Country Thunder. The main event of the Schnepf Farms Peach Festival is the peach picking! Let’s address the elephant and the room: yes, these peaches are organic. 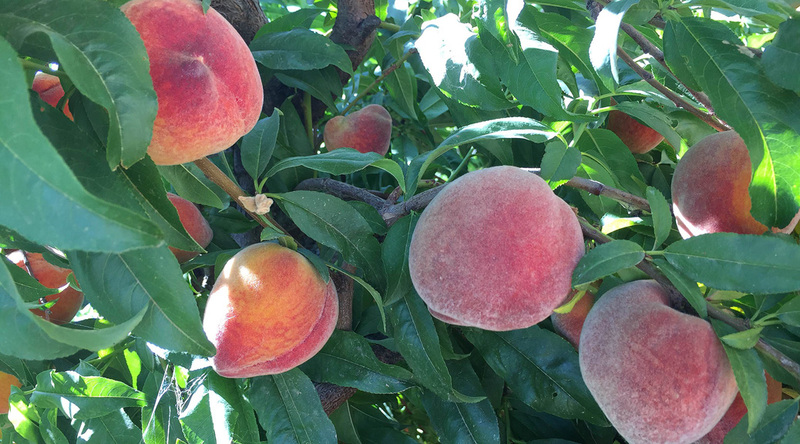 Schnepf Farms uses no pesticides on their peaches, so you know you and your family will be collecting and eating only the finest peaches that Arizona has to offer. A happy peach picker and his finely selected peaches. It’s quality, not quantity! First of all, you have to taste the peaches! Yes, this behavior is allowed. Walk through the groves and sample a peach here and a peach there. By and large, each tree produces peaches that taste similar. When you find a peach that is perfect, pick some from that same tree. These should have the same perfect taste! This method is not completely foolproof, but usually works pretty well for finding tasty peaches. Also, you must pay attention to the hardness of the peaches. If they are super soft, plan on eating them the same day. If you want some for the next 4-5 days, pick some that are just slightly soft. If you want some that will be good next week, grab some that are hard. Pretty soon you should have a nice ensemble of peaches to take home! Test the flavor of the peaches before you choose which tree to pick from! There is plenty more to see and do at the Schnepf Farms Peach Festival beside peach picking. There are hayrides that provide a shuttle between the peach orchards, in turn providing that traditional farm country experience. For the children, there is even a miniature railroad that toots its horn while taking festival goers on a little joyride. Of course, there are vendors that come out to the fairgrounds on site to provide a variety of peach-themed goodies. Peach pie, peach ice cream, peach pancakes, and more! At the back of the fairgrounds, the Schnepf’s have their own country store, complete with an in-house bakery that specializes in peach cinnamon rolls as big as your head! If you get tired of peaches, there are also the local food trucks that set up shop and provide down-home cooking like slow-cooked barbecue and tasty fair treats like freshly roasted kettle corn. We bought a big bag of kettle corn and it disappeared into our stomachs before we even knew what happened! You wouldn’t guess from this photo, but this peach-flavored cinnamon roll is nearly the size of your head! Peach lovers should mark their calendars for mid-May. The festivities usually happen the second and third weekends in May, although the farm is also open Thursdays and Fridays for peach picking and bakery pickups only, and are great days to avoid the crowds in the peach orchards. FYI: peach pies and cinnamon rolls must be pre-ordered through Schnepf Farms. Disclosure: Mountain Tripper is a participant in the Amazon Services LLC Associates Program, an affiliate advertising program designed to provide a means for sites to earn advertising fees by advertising and linking to amazon.com. @2018 — Mountain Tripper | Jake Case Photography. All Right Reserved.